"At least you can use these photos on your blog for more examples of bad seams," she told me. The seams in the photos above appear to be what is typical for larger volume shops in our area, so I cannot say that they are “sub-standard.” The changing vein direction in the corners is probably the most glaring issue. What causes a fabricator to do what is shown in this kitchen is material utilization. Since the stone has a very linear pattern, there are basically two possible approaches for doing something that would look much better than this. When working on this kitchen, we decided that the angle method would result in the best possible appearance for this particular kitchen. The other option is to run the veins in the same direction throughout the kitchen. Some of the countertop then will have the veins running left and right, and the perpendicular run of cabinets will have veins that run front to back, as shown in the kitchen below. In our opinion, this kitchen already had enough design features without adding a change in grain direction. 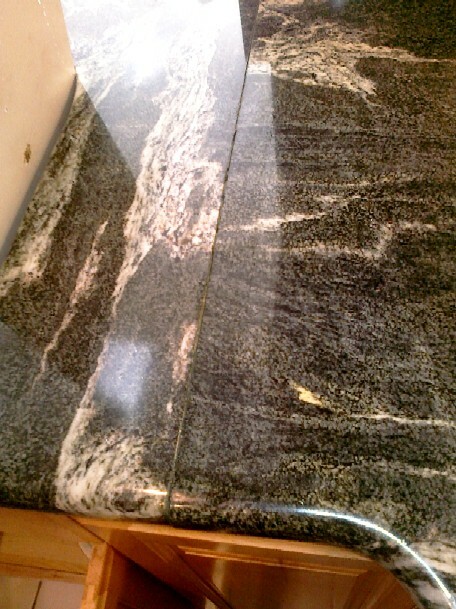 We decided, by fabricating the granite with the same all-over pattern direction, we would achieve the best-looking kitchen. To accomplish either of these layouts you need enough material so that the pieces can be cut with the veins going in the proper direction. What happens in cases like the one experienced by the disappointed homeowner, I believe, is that fabricators quote jobs without knowing that the material has a linear pattern. The job gets quoted assuming that the countertop parts can be fit onto the slab in any direction. What you see in the photos sent to us, is the result. In fairness to the fabricator, it can be more expensive to get it right. It may mean the purchase of another slab. Wanting to be competitive, he may quote the job with as little material as possible in order to get the work. On one job this year, we were competing with another fabricator and the customer informed us that we were 25% higher than the other fabricator. We were puzzled until we found out that the other fabricator based his quote on 2 slabs and we based ours on 3 slabs. 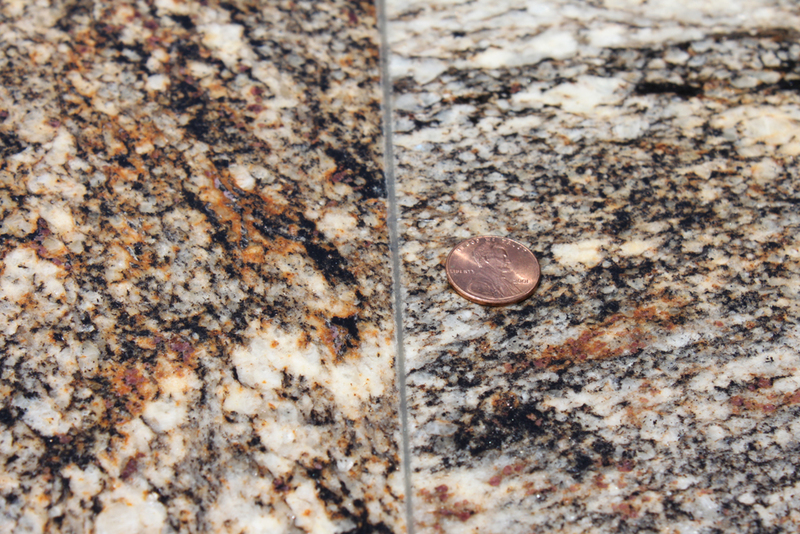 The stone had a very linear pattern such as the one in the example above, and it was a very expensive granite selection. The kitchen could fit on 2 slabs if you ignored vein direction, but the result would have been hideous. 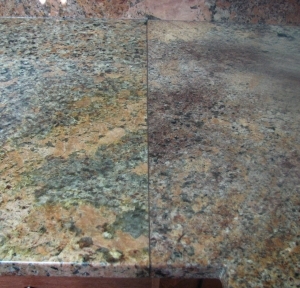 The customers only wanted a nice countertop, and were not looking to save money by only using 2 slabs. They were never consulted. The issue was never discussed. In the end, they hired us (and payed the higher price) to get the best job. The moral of the story is that the customer and fabricator should have a conversation up front about things such as seam placement and vein matching. That way they can come to an understanding between cost and perfection. There are no industry standards for vein matching at seams. The final decision depends on the fabricator’s willingness to spend the extra time and money necessary to create something beautiful. This book-matched joint on the backsplash behind the faucet creates a unified pattern. 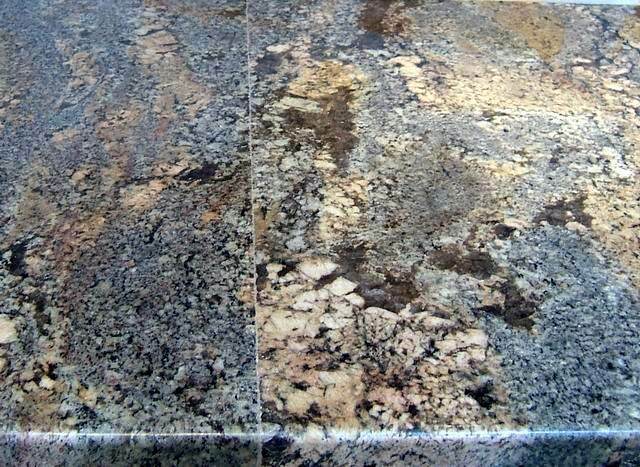 To get it right, it is important to visualize the granite selection, while considering the specific kitchen and the look the homeowners are hoping to achieve. *Superior kitchens are created when thought is put into every detail.